Visit to the top most point of the canyon. 4 hours trek to the natural park concentrated with 3 different kinds of waterfalls. 2 hours visit to the lost paradise consist of 18 natural pools. Going to Capitolio and not taking a photo on the famous canyons lookout is practically a sin. The trail to reach the lookout point is small and easy, about 100 meters. The look is incredible and makes up for all the waiting to take a picture on the most disputed stone in the environment. From above you can admire the immensity of the beautiful lake of Furnas and the rock formations. Reach by 12 PM and spend at least one hourr clicking photos and enjoying the spectacular view. A place worth visiting who are into trekking is Trilha do Sol. 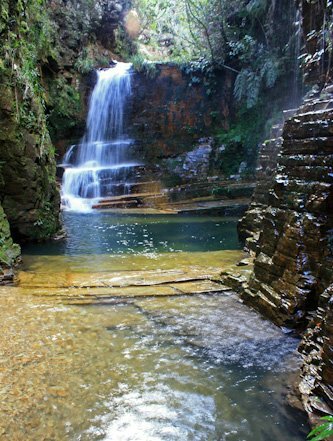 Do Grito, with a high cascade and a pool; Poço Dourado, where the sun reflection makes the fishes’ scales golden; and No Limite, where visitors will find a natural water slide. A total of 5 hour inside the park visiting 3 waterfalls will leave you mesmerized. To start the trekking by 2PM and be back by 6 PM. Capitólio owes its “beach city” fame to Lago de Furnas, one of the world’s biggest artificial lakes. Considered “Minas’ sea” and the city’s greatest attraction, Lago de Furnas is also the largest water extension in the state. A 3 hour boat ride in the lakes with a stoppage in 3-4 different spots along the lakes with an option of swimming in 1-2 spots. 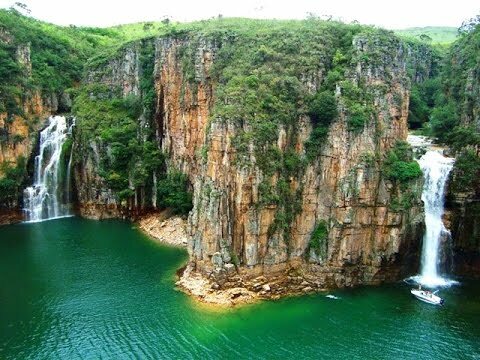 Apart from the diverse cascades and falls, visitors will have the opportunity to appreciate, like Cascata, Vale dos Tucanos and Lagoa Azul, one of the favorite attractions of the trip is Furnas’ canyons, the over twenty-meter high gorges that surround the lake. Start the boat ride by 10 am and be back by 1PM. 18 natural pools and eight waterfalls of crystalline waters. The area of preserved nature is ideal for those seeking tranquility, but does not dispense an adventure. The title of "Lost Paradise" already gives a hint that tranquility is achieved after the adventure of the path: the winding path with a narrow dirt road leads to an isolated region . Enter by 3 PM and leave by 6PM.